Stoney Point is well known by locals as a great place to head to when the weather is roaring out of the northeast. It’s an ideal spot for watching the lake in her wild moods. When waves are crashing in a good blow, the spray can sometimes fly up over the road, giving you a safe front-row seat to the lake at her most tempestuous. The lay of the land, angle of the shore, and power of Lake Superior make this a favorite spot of surfers, who say it rivals some of the best surfing locales in the world. A good day for surfing can happen even in mid-winter, and, if you are lucky, you’ll see many brave souls riding the waves here in full wetsuits. In good weather, you can explore the expanse of black basalt lava flow that is marked by clear striations and gouges left behind by the glaciers about 12,000 years ago. How to Get There: On Old 61, travel about 8 miles from the Old Pump House at Lakewood. Turn right off of Old 61 onto Stoney Point Drive. This gravel road travels about 1 mile before rejoining Highway 61. There are numerous spots with enough room on the shoulder to park safely. From Highway 61 Expressway, head north of Duluth for about 10 miles. Turn right at Alseth Road and follow it for about 1 mile all the way to Stoney Point Drive. Accessibility: This is a great place to view the lake, and because it’s so accessible by car, anyone can pull off to the side of the road and get an eyeful without even getting out. The road also offers a nice place to take a stroll to stretch your legs, and it is relatively even and flat. Getting down to the water’s edge requires some scrambling on rocks, so use caution. 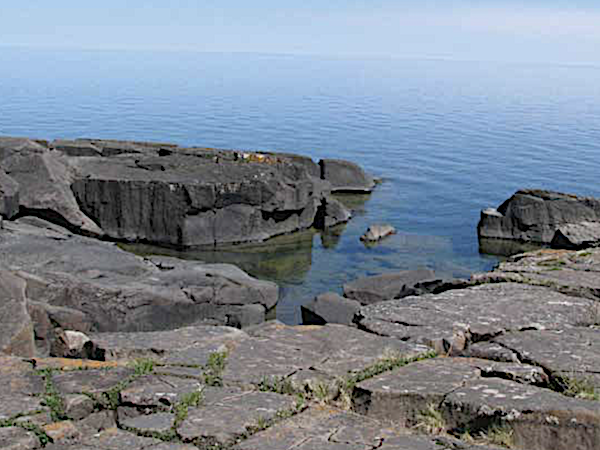 Stoney Point is only one of the many gems of Minnesota’s North Shore. For more best-kept secrets, check out Willam and Kathryn Mayo’s book 61 Gems on Highway 61. For more stories about amazing travel destinations, sign up for our newsletter now!